For several years here at First Presbyterian Church, we have spoken of our life together as a family. Our church is a fairly diverse family. We are married couples and single adults. Our church is made up of parents with young children as well as folks who have recently retired. Our church is children, youth, and young, middle and older adults. 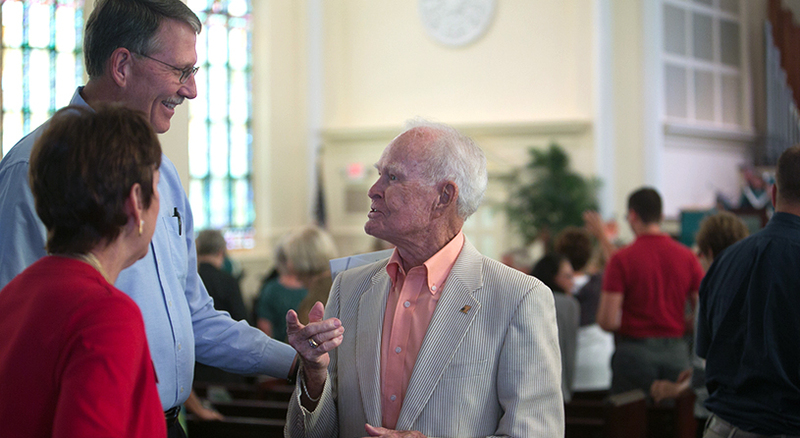 There are over 1,000 people who make First Presbyterian their church home. As with most families, just being together is a celebration. Our church’s children enjoy time together on Wednesday afternoons in our Christ’s Kids program. The Middle School and High School Youth have organized fellowship groups on Wednesday and Sunday evenings. And the adults in our church gather as Christian friends throughout the week, month and year. The Presbyterian Women meet in their circles for Bible Study, prayer, and fellowship, as do the men at the weekly Men’s Lunch, Fellowship on the First Sunday, monthly birthday parties for members over 80 years of age, the Fall Festival, Shrove Tuesday Pancake Supper, All-Church Birthday Party, Fun Timers’ events and Youth Group are just some of the ways we meet together within the family. This family is always willing to make room for another chair at the table.